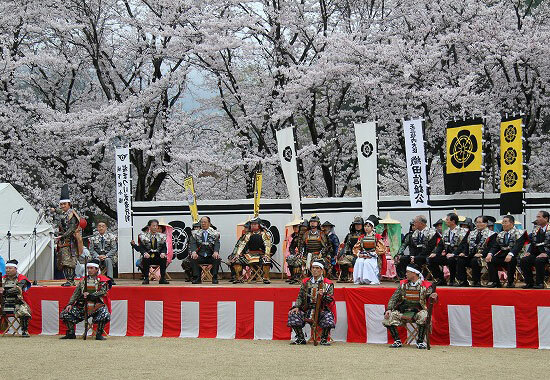 The biggest event coloring the spring of Kanra. A gorgeous and majestic scroll of the Warring States period unfurls as a procession of Oda troops wearing armor and helmets follows a leader on horseback amid dancing cherry blossoms. The procession leaves from Rakusanen, a nationally designated scenic spot, and parades along alleys that are vestiges of the Edo period, the samurai district, and Ogawa Zeki (Ogawa sluice), which was selected as one of Japan’s 100 remarkable waters. At the festival venue, Kanra Sogo Koen Park, a ceremony is held to herald the triumphant return of the procession of warriors. 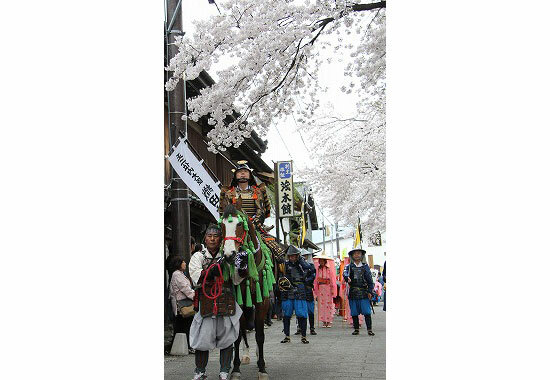 There are also attractions such as open-air tea ceremonies, taiko drum performances and matchlock demonstrations, and local agricultural specialties are also on sale.